The Autumn League are a new collective from Sydney, Australia. 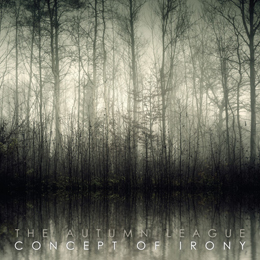 They recorded this first album, Concept Of Irony, at the end of 2013 at Bright Lights Sound Room, and had it mixed and engineered at MCM Recording by Russell Finch in early 2014. The Autumn League are a Christian project, awaiting the return of Jesus Christ, and this soundtrack is dedicated to this guy. And of course the lyrical subjects are heavily inspired by biblical themes. I do not care, because 1) there are lots of Death and Black Metal bands with Satanic inspirations that are too ridiculous to experience, and 2) there are many bands that are Christian-inspired but still do play extreme and brutal stuff, as mean and aggressive as several blasphemous colleagues. Concept Of Irony is a pretty lengthy album. It consists of fifteen hymns, having a total running duration of more than an hour. And I have to admit, it’s almost midnight, tomorrow will be an intensive day (once again), but I just feel like having this album reviewed now. I listened to it a couple of times; the last time was yesterday (actually, it was today, shortly after midnight; damn, I should sleep from time to time, don’t you think)… Anyway, Concept Of Irony draws its elements out of almost each single existing form of (Extreme) Metal, with Black, Prog, Black, Death, Goth, Black and Unblack-blacker-blackest metal as focus. But what an experience this is. It truly is unique, and I mean UNIQUE, to have such a variety and still maintaining a specific, characteristic concept throughout almost sixty two minutes! Okay, let’s have an objective approach. …though it is almost impossible to start… Despite a huge variation (see further), Concept Of Irony surely is one of the most cohesive albums (for being so diverse), and despite the very lengthy duration, I am very disappointed each time when this material gets finished. There are ‘clean’ vocals, and I like them - can you imagine. There are melancho-goth-symphonic passages, and I do not get nauseous - can you imagine. There’s an injection of modernism and I like to bang my head each time again - can you imagine??? No, I want to say that this Australian band is one of the best things I’ve heard in years when it comes to ‘modern’ stuff. Being an obsessed fan of the old school, and having a natural allergy for everything that reeks of artificial pulp, I have converted by means of this album. And believe me, it goes for every passage, whether it be a harsh and blackened one, a melodic and modern piece, or a calmer, integer and even emotive excerpt; there is truly nearly nothing that might annoy. I have so many things on my mind right now. I am not referring to personal issues (sic…), but to ideas, concepts, opinions ‘bout this stuff. But I have no idea how to express, how to organise. Let’s say that this album needs your attention. Listen. Listen once again. Enjoy. Forget the religious message if you do not care, or if you do not agree (I made abstraction of it too, once again, because when the sonic result counts, there is no godly, satanic or whatever entity that rules; and now: self-censorship). Take your time, maybe you’ll smoke something green (or is it forbidden by your god; my goddess does not care ;-) ) (I am not doing so, but I am sure it might help, for this is quite a lengthy journey to experience), and undergo this intense experience of proportional heaviness, suffocative extremism, and malignant beauty. [I need to apologize, because this review does not say anything at all; but even now I am still searching for the right words. No, don’t be afraid, I am still not subject to eternal divine obeisance. Just enjoy this amalgam of Death and Black Metal, modern Rock, Whitegaze, Post-Metal, melancholic Gothic stuff, Ambient / Industrial / Electronics, and so on…].